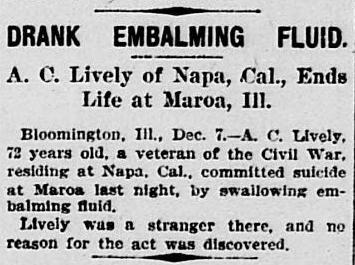 One would think that it would be fairly difficult to accidentally drink embalming fluid, but there are numerous accounts in historic newspapers of people who did just that in the late 1800s through the early 1900s. 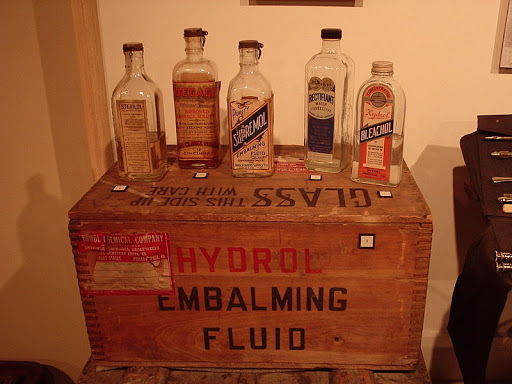 Access to chemicals used to preserve bodies was greater during those times, in part because most funeral preparations took place in the home. 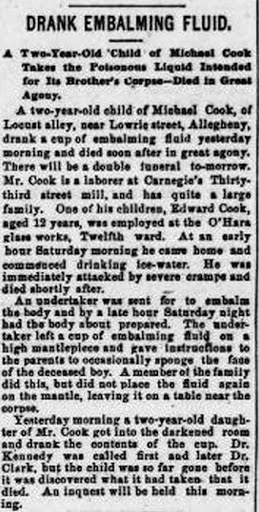 In some cases, the undertaker had left behind embalming fluid instructing the family to sponge some of the solution on the body at specified intervals to keep it “fresh” before burial. 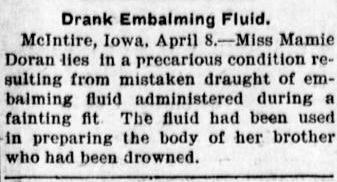 Other times the fluid was left behind after the burial in the same fashion a plumber might accidentally forget to take his wrench when leaving a job site. 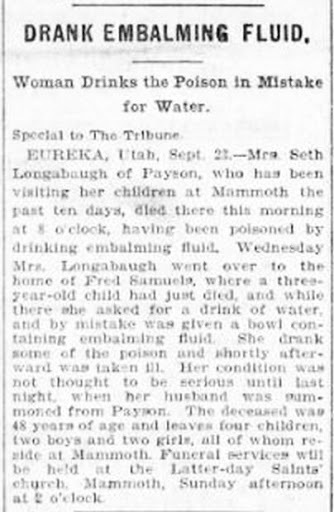 A careless individual could spill the fluid on other food items or an unsuspecting victim would mistake the solution for water and take a sip, realizing their mistake only after the chemicals were in the system. 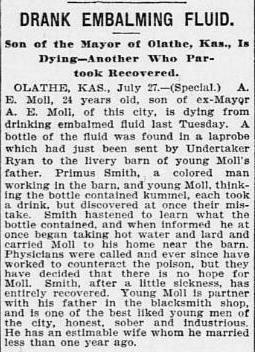 Others drank embalming fluid, mistaking it for alcohol while looking for a buzz and on at least one occasion someone (Mr. Lively) ingested the poison in order to commit suicide. 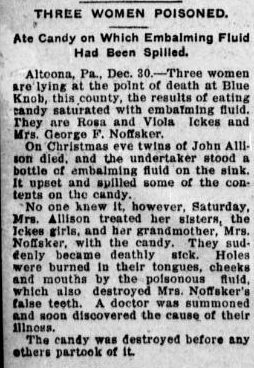 The exact formulas of the embalming fluids that these people ingested isn’t listed in these clippings, but the solutions could have contained formaldehyde, alcohol, arsenic, bichloride of mercury, sulfuric acid, zinc chloride, turpentine, and/or creosote.